There are 2 types, 1 is square and the other is round. The original drive pinion gear was made of inferior materials. Through the years cold, hot and heat have destroyed the gear and turn them into a soft material. 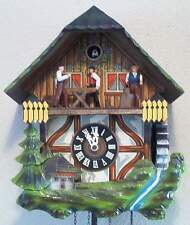 NOTE: THE ABOVE PICTURES ARE ONLY TO SHOW AN EXAMPLE OF THE TYPES OF CUCKOO CLOCKS I WORK ON - - - THEY ARE NOT FOR SALE At last, a repair service you can afford. 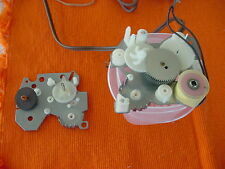 This service includes replacing bellows where needed. This will need to be rewired and could use a cleaning Combined shipping for multiple items won. Please see photos for more details. This is being offered with no reserve! All items are normally shipped within 2 days. All items must be shipped. I do not offer local pickup. WHAT YOU ARE BUYING IS AN INCREDIBLE EARLY 1930s MANTLE STYLE HAMMOND " SKYSCRAPER " SOLID BLACK BAKELITE ART DECO CLOCK. THIS BEAUTIFUL AND MAGNIFICENT CLOCK IS A GREAT EXAMPLE OF 1930s ART DECO STYLE. Antique Dixie Milk Clock Vintage Working Old . Condition is Used. Shipped with USPS Priority Mail. These clocks were very popular in th 1960s. It’s weight driven by two brass weights. As you can see on the photo's, this clock is made by the best materials. Oak cabinet is solid, with no cracks or repairs, is in excellent condition and has nice incised and applied designs. Glass is original with a silver colored design, with little wear. Original solid brass dial pan polished and finished. I HAVE TONS OF PARTS AND I AM ALWAYS OUT LOOKING, I DO MY BEST TO HAVE A LITTLE OF EVERYTHING LISTED AND TRY TO LIST MANY OLD AND HARD TO FIND PARTS. HELLO EVERYONE. VINTAGE OLD 1940’s ANTIQUE WARREN TELECHRON “GLAMOUR” ART DECO CLOCK in working condition, Model 3H91. Clock was manufactured from 1940 to 1942, it measures 5 1/4” square. The clock features an “indicating device” which would turn red to alert the owner of a power outage. This onyx clock is made of brass set in marble, the brass shows some tarnish from age. ( SEE PICTURES ). ORIGINAL ALARM WEIGHT ! ORIGINAL PENDULUM BOB ! I've done my best to describe the item thoroughly and by taking enough photos of the clock and or clock parts. VERY LARGE AND VERY HEAVY CLOCK ! ANTIQUE SETH THOMAS DORIC BEEHIVE 90B 5 BELL MANTLE CLOCK SONORA CHIMES & KEY. Winds and runs. Chimes work too. Not sure how accurate it is, may require some cleaning and tuning. Finish is a little crackled from storage and age. Please examine pictures closely and ask any questions before buying. Thanks. Oak finish has darkened from age. Sessions Mission Design. As Found At A Local Estate. It has been running since we bought it at an Estate Sale but it may need servicing due to it's age. INCLUDINGflawless GOLD PLATED BASE,FRONT BEZEL AND ALL the following are new reproductions INTERNAL SPRINGS, WASHERS, MOPTOR ETC. EXCEPT FOR THE PARTS WHICH ARE NOT AVALABLE NEW. THE USED PARTS ARE THE HOUR HAND GEAR DRIVE AND THE PLASTIC BOTTOM BASE PLATE (SHOWN IN RED). The nicely reverse stenciled glass adds to its beauty with an embossed pendulum visible behind it. Get on the Bandwagon, and bookmark ProClocks for all your clock needs. It's Ticking! ASHLAND, MASS. U.S.A. 3-CD-942 E.C.E.". It has use marks, scratches, worn paint, rust spots, sold "AS IS". Up for sale is this neat clock. It is not running. This looks to be a pretty early model. Maybe 1890-1900. One of many clock pieces from a prominent retired Gold Coast (Long Island) clockmaker’s personal Collection/Inventory. Stay tuned. I am assuming they works being what they are. But in any case, they are priced very modestly. 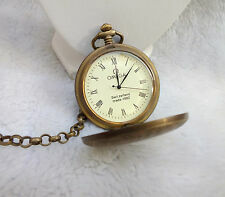 NICE Old Original TIME ONLY SPRING CLOCK MOVEMENT WITH HANDS !! I've done my best to describe the item thoroughly and by taking enough photos of the clock and or clock parts. GOOD SPRING ! ORIGINAL HANDS I THINK ! GOOD HANDS ! 18" DROP I THINK ??. This maybe what you are looking to finish your project ! OLD ANTIQUE MAUTHE ART DECO NOUVEAU SHELF MANTEL MANTLE SHELF CLOCK GERMAN NICE! CLOCK RUNS AND CHIMES. CHIME SOUNDS AMAZING! LOOK AT PICTURES FOR CONDITION. COMES WITH KEY AND DOES NOT NEED A PENDULUM . BEM BAM CHIMES. KEY IS A KARL LAUFFER BRAND. NAME "MAUTHE" ON DIAL. SELLING THE CLOCK AS A RUNNING CLOCK. DURING SHIPPING "IF" DUE TO SHAKING IT DOES NOT RUN YOU CAN RETURN. Made by Plymouth. I believe it was made in the 1920's. MADE IN the USA. Looks to be oak. Great wood design base and overall shape. Looks great! I am assuming it will need to be cleaned/adjusted as it is an antique. The horse is in great condition with the chain intact and a copper and silver finish on the metal. A Lincoln clock that works and keeps time! It also has the original cord and is in excellent condition. The clock has decorative cowboy boots, rope, and a cowboy hat at the bottom of it There is some fading of the finish on the horse and clock due to the age but it still looks great! The wooden platform is in good condition. It has a some slight marks on it here and there. This is such a fun piece to add to or start a western,cowboy or horse collection! One of many clock pieces from a prominent retired Gold Coast (Long Island) clockmaker’s personal collection. Stay tuned. You can also pick up the clock then you can see what you buy. Grandfather clock face in used condition. Has a few scuffs and blemishes on it with a good buff could look as good as new. Is exactly as pictured. Thank you. August Schatz was born on June 25 1854. Schatz, in 1881, set up Jahresuhrenfabrik AG to work alongside Harder to make the Harder pattern anniversary clock, Harder, along with Jehlin, owned the patent of the Torsion Pendulum clock. It is also one of the largest clocks of this type. The logo can be identified as the Freiburg Logo and dates the clock as from 1923-1933. Indeed, my mother received this clock as a wedding gift in 1929. Condition: The item is in good used condition (see pics or ask for more pics). By buying this item you agree that you are only buying no more or no less then what is picture in photos. Tested & working. Nice collectible clock. 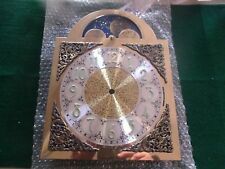 VINTAGE OLD 1940’s or 1950’s ANTIQUE TELECHRON “GLAMOUR” ART DECO CLOCK -Does Work. It measures 6”H by 6”W by 3”D. Condition is Used. Please see pictures and ask questions before purchase. Thank you. Shipped with USPS Priority Mail. Presented for your consideration is this antique shelf or mantle clock. The door easily opens and closes. On the glass is an ornate design done in red, black and gold gilt paint. Visible under the dial is the alarm bell. Vintage grandfather clock face. This is new old stock and will come as pictured. Item is 13.75” tall 10” wide. See pics. Thank you. 21" x 7 1/2" deep x 10" tall. Previous owner installed 3 cup hooks. 2 holes on back for mounting. Back board has a slight bow. short split on front board. Very good used condition. Very good used condition- normal wear from use and cleaning. Pretty and usable. I would remove the bezel cause it looks great open. Ingraham Mantle Clock Over 100 Years Old May Need Some Work.